Everyone here is a movie geek and we're constantly trying to keep up with the latest releases, official dates, plans and projects and so on. I came across a cool new app for iOS (iPhone/iPad) that helps you organize upcoming releases and even reminds you when they hit. The app is called Todo Movies, made by German company Taphive GmbH, and it's very simple and straightforward, but I thought might be a good suggestion for fellow movie geeks who want some better organization to their release schedule (in addition to our own release schedules, of course!). The app only costs $0.99 and is totally worth it once you take a closer look. If you're interested, click above for the iTunes link. 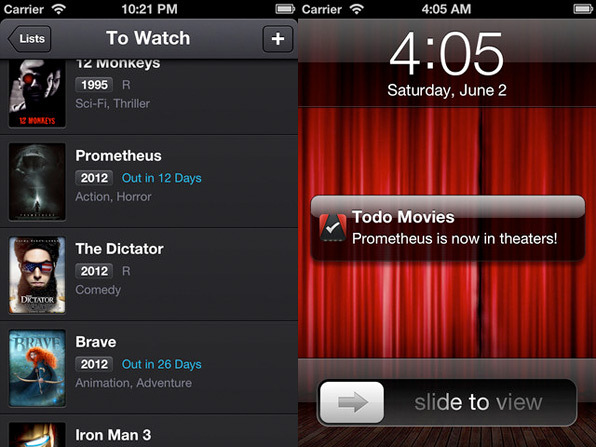 "Todo Movies is a beautiful, easy to use yet powerful to-watch list app for iOS. Keep track of movies you want to watch and never miss a good movie ever again!" The app allows you to search and add movies to your list of upcoming releases, with information for each. It will send you a notification when the movie finally arrives in theaters (if you wish). You can create custom lists (besides just "To Watch") that can be shared with friends. It's just a fun, little cool app to keep your eye on upcoming releases (reminder: here's our schedule, too). Let us know if you check it out and put it to use! Wow so this site does endorsements too for apps. No endorsement beyond just finding a cool movie-related app that I thought was worth featuring. No one is paying for anything. Just found it, thought it was worth writing about. Apps are cool, no? I just commented to say whoa........new voting system. kewl. LOL. I like it, but it's one of those things where I dont think its worth 99 of my pennies when there are other available resources readily available that provide the same service for free—that probably take the same amount of time to search, click, find and discover than locating and loading an app on your phone. Nifty, but should be free, as movie-themed ads on this app would probably generate more revenue anyways.